The Philadelphia Phillies’ Cole Hamels threw the 13th no-hitter in team history, breaking the Chicago Cubs’ near 50-year streak of avoiding a no-hitter. Hamels threw 128 pitches and walked two batters, securing the final out of his 5-0 win when center fielder Odubel Herrera slipped on a deep fly ball on the warning track yet gloved the ball at his feet. 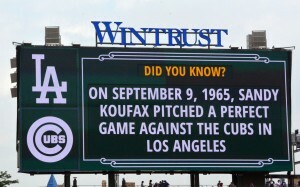 It was Wrigley Field’s first no-no since Milt Pappas’ 1972 no-no, and the first no-hitter thrown against the Cubs since 1965, when the Los Angeles Dodgers’ Sandy Koufax threw a perfect game. 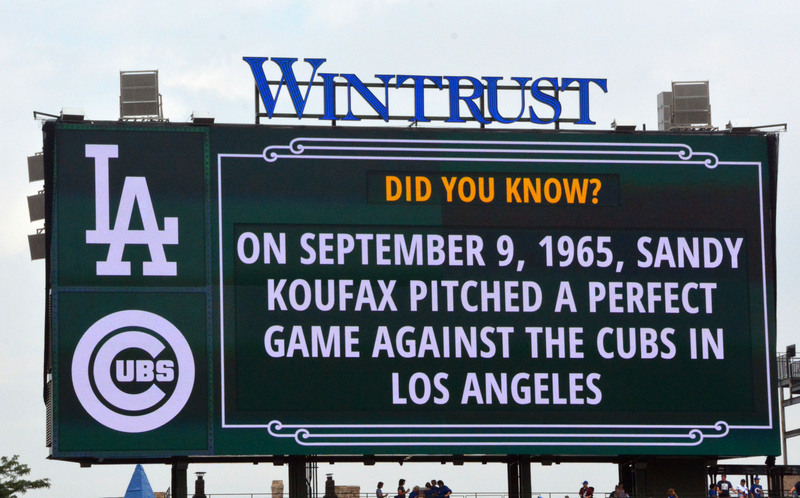 The Cubs avoided the no-hitter for 7,920 games between the gems by Koufax and Hamels — a streak tracked diligently by @CubsNoHitStreak since 2012. It was the fourth no-hitter caught by Carlos Ruiz, tying him with the Boston Red Sox’s Jason Varitek for most caught no-nos in the majors. The Phillies now have thrown 13 no-hitters over the team’s history (see the list here). The Cubs have been no-hit seven times (see that list here). PreviousPrevious post:Adonis Terry’s first no-no, 129 years ago todayNextNext post:The other ‘Johan’ Santana’s no-hitter, 4 years ago today.